The income tax department has initiated recovery proceedings against cellular operator Vodafone Essar Ltd, the Indian subsidiary of global telecoms firm Vodafone Group, and attached five bank accounts of the company for nonpayment of taxes (including interest) to the tune of Rs 753 crore for three consecutive assessment years from 2005 to 2008. The proceedings were initiated after the department rejected the company's contentions for claiming deductions under section 80 of the Indian Income Tax Act for the three assessment years. Income tax commissioner (I) Ashok K Kaushal said five bank accounts of the firm were attached after following the due process of issuing assessment notices. He said the company was issued assessments orders for the assessment years 2005-06 and 2007-08 in December last year and for the year 2006-07 in February 2011. The assessment orders were reportedly issued after income tax officials disapproved deductions claimed by the company under section 80IA (deductions in respect of profits and gains from industrial undertaking) in these assessment years. Subsequently the department raised a tax demand on the company’s income amounting to Rs 146 crore for 2005-06, Rs 297.2 crore for 2006-07 and Rs 310.11 for 2007-08. Though the company’s corporate office is not located in the region its tax returns are being filed here. Police investigations into the incident of thrashing of a head constable outside a liquor vend in Sector 22 last night has revealed that two police personnel, who fled the scene leaving head constable Darshan Kumar alone to face the wrath of drunk youths, were consuming liquor at the same vend. The two PCR personnel were suspended today. While their duty was at Hotel Taj GVK in Sector 17, they had come to Sector 22 to drink alcohol. Those suspended areSub-Inspector Boota Ram of the Indian Reserve Battalion and constable Paramjit Singh. Their medical examination revealed alcohol in blood. Based on the medical report, they were suspended, said Roshan Lal, DSP (PCR and communications). The presence of the two policemen points to the possible complicity between them and the owner of the liquor vend in Sector 22 located near the ISBT roundabout. Head constable Darshan Kumar received a skull fracture after he was assaulted by drunk youths as he went to down the shutters of the vend that was open after midnight. A day after the brazen attack, the police has arrested two youths in a case of attempt to murder. The police arrested Rajdeep Singh, including a B.Tech final year student, and his cousin Gurpreet Singh, an agriculturist. Both the accused are in their early 20s. Rajdeep, who hails from Bathinda, is studying at Swami Vivekanda Institute in Dera Bassi. He stays as a paying guest in Mohali. Gurpreet hails from Barnala. Two other accused are absconding. One of them has been identified as a resident of Khanna and police raids are on to arrest him. Want to get liquor at midnight or even in the wee hours? It is not a problem with many liquor vends in the city willing to offer “special service” to booze lovers well after the official closing time of 11 pm. This illegal practice has been continuing for long thanks to a “well established” and “time-tested” system of alleged payment of “hafta” to the police. The situation is the same across the city, including prime sectors of 17, 22, 24 and 27. It is more blatant in Sectors 30, 31, 43, 49, 55 and 61, Industrial Area, Kaimbwaala and Attawa. A late night visit to various liquor vends located in different sectors after 11 pm revealed that many vends, especially those located on the border of the city and in the Industrial Area, were engaging in brisk business without fear of being checked by the law enforcers. It may sound odd, but this did not come as a surprise to people at the vends. “So what if the shop is open? It is a routine matter,” commented a “rehriwala” near the vend in the Sector 31 market. The modus operandi is simple: Shopowners down their shutters after 11 pm, but keep either a side window or the rear door open. “I can get you alcohol any time you want. But you have to dish out some extra bucks for that,” said a youngster, who came to buy a bottle from a vend in Sector 55 around midnight. Instructions have been issued to the officials concerned to check the menace. This is especially so after the incident that occurred on Tuesday night when a head constable was beaten up by drunk youngsters around 1 am in front of a liquor vend in Sector 22. Surprise checks by excise teams would be intensified. The licences of habitual offenders would be cancelled. Hundreds of patients at the department of gynaecology, Government Multi-Speciality Hospital (GMSH), Sector 16, are in for hard times. Close on the heels of the departure of three doctors from the department in January this year, a fourth has now put in her papers plunging the department into a crisis. Dr Suneet Walia submitted her resignation yesterday. Sources close to her said she had been finding it hard to cope with the stress in the backdrop of the huge rush due to staff shortage. After the exodus of three doctors since January 31, the number of gynaecologists in the hospital has reduced to five. Surprisingly, these five doctors are expected to manage an outpatient department (OPD) of over 250 patients in addition to handling patients admitted to general wards and carrying out surgeries, including 25 deliveries every day. There were 18 doctors in the same department about five years ago. On January 31, two senior medicos, Dr Amarjeet Kaur and Dr Reeta Bhardwaj, quit the hospital. While Dr Amarjeet Kaur surrendered her three-month salary to seek voluntary retirement, Dr Bhardwaj sought repatriation to her parent state of Punjab. The third doctor, Dr Pushpa Mathuria, retired on attaining superannuation. The shortage of doctors has been plaguing the hospital in almost every department for long, putting the health services under severe strain. On July 21 last year, a woman was forced to move from one counter to another during labour leading to the death of her newborn who was delivered in the OPD. Subsequently on December 16, transfusion of the wrong blood group to a pregnant woman lead to the death of the foetus and damaged her kidneys. The total number of doctors in the hospital has been reduced to 113 against a sanctioned strength of 145 even as the number of patients has increased manifold. Contract health staff, watch out! Over 700 contractual workers on sensitive posts with the UT health department, recruited through outsourcing, including doctors and paramedics, are under the scanner, with the department proposing to verify their antecedents for any possible violation in their appointments. The trigger in this regard was provided by the detection of colour blindness, an ailment a patient has since birth, in a driver, Randhir. He had been working with the department for over two years at the Government Multi-Speciality Hospital (GMSH) in Sector 16. The ailment was detected during medical examination at the hospital. Fortunately, ambulances and other vehicles driven by Randhir did not meet with an accident till the ailment was detected on March 25. Persons suffering from colour blindness cannot differentiate between colours and it becomes difficult for them to follow traffic signals, which can endanger the life of the driver and passengers. After the detection of the ailment, Randhir reportedly stated that there were many others in the hospital who had been employed though they did not have the required educational and technical qualifications. A majority of them had been deployed on sensitive posts as laboratory technicians, operation theatre technicians and pharmacists. Enquiries revealed that the hospital had hired the services of more than 700 employees through three outsourcing agencies. Doctors, laboratory technicians, operation theatre technicians, clerks and drivers were hired through Good House Keeping, an outsourcing agency. Good House Keeping manager SP Singh, when contacted, said their job was to bring candidates with suitable qualifications to the hospital authorities and the department conducted the interviews and got the credentials of candidates verified before employing them. In case of regular employees, the antecedents were sent to the Deputy Commissioner and the educational authorities concerned for verification, sources said. This practice was not pursued in case of contractual employees hired through outsourcing agencies, they added. There was every possibility that some of them had been carrying fake certificates, said the sources. The GMSH authorities had proposed a comprehensive verification of credentials of all such employees. When contacted, UT Director Health Services, Dr Chander Mohan, said the incident was brought to his notice and he was looking into the matter. “Who is Preity Zinta? You cannot go in without proving your identity,” said a CISF cop whom the Bollywood actress refused showing her identity card at the Chandigarh Airport before boarding her flight here today. The drama took place when she reached the airport. The cop on duty asked her for the ticket and she gave him her e-ticket. He then asked for her identity proof, which has to be furnished along with the e-ticket. The actress was offended and retorted: “Don’t you know who I am?”, to which the cop said: “I don’t know anyone without his/her identity card.” He did not relent and the actress too stuck to her stand. It was only after the intervention of HS Toor, Airport Director, that the matter was resolved. He escorted her to the flight boarding platform. Ignoring regulations governing uniforms displaying various ranks, it has now become a routine practice for junior officers to wear uniforms of higher ranks and lead parades.This was evident today, celebrated as Fire Services Day, when leading fireman Baljinder Singh, who led the parade contingent, was seen wearing the uniform of a higher rank. After the flag hoisting ceremony, he led the firemen to the office of city mayor Ravinder Pal Singh. While no organization allows a junior officer to wear the uniform of a senior rank and lead a parade, the fire brigade has done it twice. On Republic Day last year, in which the sub fire officer’s uniform worn by the fireman who led the parade at the state level function, Jag Jewan Pal, had three stars for which he was not entitled. According to the norms, a sub fire officer’s official uniform can only have one star. The Punjab Municipal Corporation (MC) Fire Service Rules of 1977 state that no official can don a uniform of a higher rank. However, MC joint commissioner and chief fire officer Kamlesh denied Baljinder wore the uniform of a higher rank during the parade. When questioned about the fire department’s parade protocol he merely said “I’ll look into the matter”. According to his official order issued last December, Sunkaria had instructed Baljinder would be entrusted with the responsibilities of a sub fire officer in addition to his own duties. An official communiqué said “as he was not holding the post on current duty charge or additional charge there will be no hike in his pay”. The fire department has recommended disciplinary action against Baljinder for breaching rules following a complaint filed by one the employees. A decision on the matter is pending with the chief fire officer. The new terminal building of the Chandigarh airport was informally opened for passengers today. The director of the airport HS Toor said the terminal had been opened on a trial basis for the next fortnight and during this period the process of shifting the official establishment from the old building to the new one would be undertaken. Toor also said no VIP had been invited for the inauguration of the new terminal. He added, “It has been simply thrown open for everyone from today and all passengers entered the airport from the new terminal.” All four private airlines operating from the airport were seen shifting their offices to the new building. However, the process will take a month to finish, said an airlines official. Sources said the new terminal was opened at a very short notice and the main aim of the AAI was to woo international airlines to start flights from the city. Toor said, “The new domestic terminal is good enough for international air traffic, the local airport authorities have proposed starting flights to Dubai, Malaysia and Thailand from the city soon.” The new terminal building is totally air-conditioned and equipped with latest technology for checking luggage. The parking space is also very close to the new terminal as compared to the old one. Rajan Trehan, a businessman, who arrived here from Delhi this morning, had all praise for the AAI. “A lot more has to be done to meet the domestic and international standards and it will prove to be a boon for passengers as well as for the airlines operating from the new terminal building of the city airport”, he said. “I am surprised and thrilled to see this spacious building,” said Rehman, an employee with an MNC in Mumbai, pushing his luggage trolley forward. 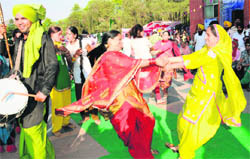 More than 200 folk artistes from Virsa Vihar Kender, Amritsar, Malwa Heritage foundation Bhatinda,the NZCC, Patiala, and amateur folk dancers from other places enthralled the audience at a cultural show here today. The show titled as “Amritsar de Rang - Bhaaji Gursharn Singh de Sang” by the Punjab Arts Council was a tribute to the contribution of Gursharan Singh to Punjabi theatre, who was also the chief guest at the occasion. PAC chairperson Harjinder Kaur and IAS Kahan Singh Pannu ,DC of Amritsar, presented a cash award of Rs 1 lakh to Gursharn Singh. Dolly Guleria, Gurmit Bawa as also Jatinder Kaur,and Kewal Dhaliwal regaled the audience. Gursharn Singh was brought by admirers in a procession from his residence amidst the beating of drums. The Punjab Arts Council plans to make such melas a regular feature said Harjinder Singh Khalsa. Once again, the municipal corporation (MC) authorities have given the lollipop of an insurance cover to its 261 firemen on the occasion of the Fire Services Day.Addressing the firemen, MC Commissioner Sunkaria said here today that the process of a life insurance scheme for firemen had been completed and it would be implemented soon. For the past three years, while addressing firemen on this day, the MC Commissioner or the Mayor had been giving them the same assurance. In 2008, when Amarjit Singh Mavi lost his life during a fire operation, the MC General House had unanimously approved bringing all firemen under insurance cover and asked the authorities to prepare a detailed draft on it. In 2009, the House approved the proposal and the authorities invited companies to finalise the insurance amount. As per the proposal of the fire and emergency department, disability and medical claims were included according to the post. As per the draft, chief fire officer and station fire officer were entitled to Rs 10 lakh in case of death on duty. For fireman, leading fireman and sub-fire officer, the amount was Rs 7.5 lakh. In case of permanent disability, firemen of all ranks were to get Rs 7.5 lakh. For partial disability, the amount proposed was Rs 5 lakh. Firemen of all ranks could also avail themselves of medical claim of Rs 2.5 lakh in case of a mishap. As per MC records, the authorities rejected all companies which had applied due to the low rate quoted for insurance and medical allowance to firemen. For the past 15 years, employees of the fire department had been demanding insurance cover on the pattern of other paramilitary services which involved risk of life while on duty. The insurance cover policy being framed would be for MC employees and the implementation of a similar scheme for employees on deputation from the Chandigarh State Agriculture Marketing Board was yet to be finalised. A week-long special fire safety drive was launched by the fire emergency department to check fire safety norms in buildings and markets in the city.Mayor Ravinder Pal Singh disclosed this while addressing firemen on the Fire Services Day here. Smartly dressed fire brigade personnel took out a parade, which was inspected by the Mayor, followed by a flag-hoisting ceremony. A two-minute silence was observed in the memory of those firemen in the country who had lost their lives while on duty. Addressing the firemen, the Mayor applauded the bravery of fire personnel during crisis. MC Commissioner Roshan Sunkaria appreciated the fire department’s work during major incidents of fire, including the recent fire at Sector 22. He said the Fire Services Day was observed all over the country since 1944, the year when more than 500 persons, including 66 fire brigade personnel, lost their lives fighting a major fire in Mumbai. That day, a huge consignment of arms and ammunition, to be used against Japan by the British, kept at the Mumbai dockyard, had caught fire. Since then, April 14 was being observed as the Fire Services Day. MC’s fire and emergency services chairman Devinder Singh Babla and councillors AP Sanwaria, MPS Chawla, Vijay Singh Rana and HC Kalyan were present. A new-look UT administration is in the offing. While the new adviser to the administrator, KK Sharma, an IAS officer of the 1983 batch of the AGMUT cadre, joins office on Friday, the Chandigarh Housing Board (CHB) and the city’s municipal corporation are to get new heads shortly. In fact, the new CHB chairman, Satya Gopal, a 1988 batch IAS officer of the AGMUT cadre, is due to take office on April 25. Outgoing MC commissioner Roshan Sunkaria had already been repatriated to his parent cadre of Punjab and a panel had sought his replacement. Finance secretary VK Singh joined the administration only recently. In the backdrop of the changes at the top echelon and middle level with the repatriation of several PCS and HCS officials, the administration will don a newer look in the months to come. After The completion of his three-year tenure by home secretary Ram Niwas next September will complete the revamp in the UT bureaucracy. Official sources said the new administrative setup might bring “positive changes” on the development front. During the past three years the ghost of the “mega” projects haunted the administration with major projects coming to a halt. “With a new team of officials at the helm of affairs in the UT administration, development activity in the city should stage a comeback. With less interference from Raj Bhavan in the administrative work now, the new mandarins would be in a better position to perform,” a senior officer added. 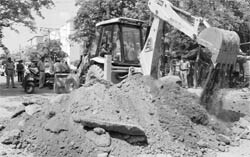 The slugfest between former Punjab governor and UT administrator SF Rodrigues and his outgoing adviser, Pradip Mehra, over the mega projects took its toll on the city’s development. Flying from smaller cities such as Chandigarh, Srinagar and Dehradun is likely to become costlier, with the state-owned operator, Airports Authority of India (AAI), proposing to levy a user development fee (UDF). The AAI has sought the Civil Aviation Ministry’s approval to levy the UDF in the range of Rs 200 to Rs 250 on those flying out from these airports, an AAI official said. A proposal to impose development fee on passengers departing from 12 airports being modernised by the AAI was likely to get government nod soon, which would enable the state-owned body recover its cash shortfall, the official said. The 12 airports where the AAI had been carrying out major expansion and modernisation activities were Aurangabad, Bhopal, Dehradun, Coimbarore, Indore, Lucknow, Madurai, Ranchi, Srinagar, Raipur, Surat and Chandigarh. With the AAI developing a total of 35 non-metro airports, the imposition of the fee for the remaining airports would be decided on a case-to-case basis, depending on the cost situation and the shortfall. AAI sources said UDF was a charge levied by it to recover part of its investment for upgrade. Sources said a major reason for fund shortage was that air traffic was not improving as airlines were not operating more flights. Meanwhile, domestic airlines opposed the proposal to charge UDF from passengers, saying the move might lead to a drop in passenger traffic. Airlines said the move would also hit traffic. “Air traffic on non-metro routes is still very low. Higher tariff will only act as a dampener,” an executive of a low-cost airline said. They said the airport operator should not insist on higher charges as the aviation industry had been just picking up after a severe downturn. Lauding the infrastructure coming up at the city airport, representatives of Kingfisher Airlines, GoAir, Jet Airways and Indian Airlines echoed similar views. The body of newly born girl was found abandoned under the bridge near the railway station light point here this evening. It was spotted by a passerby and the police was informed. The body was kept at the mortuary of the Government Multi-Speciality Hospital in Sector 16. The police said the body appeared to be a couple of days old. All hospitals in the city were informed. The UT Consumer Disputes Redressal Commission has set aside the order passed by the consumer forum, dismissing a complaint filed by a city resident against the State Bank of India (SBI), and directed the bank to redeposit Rs 28,408, along with 12 per cent as interest and litigation costs of Rs 5,000, to the complainant. Ghanshyam Dass Goyal, an ex-employee of the SBI, who was removed from the job, was operating a savings bank account from the Ram Darbar branch. He stated in his complaint that there was a credit balance of Rs 3.04 lakh in his account on June 9, 2009, but when he visited the bank on July 3, 2009, Rs 28,408 had been debited from his account. When the complainant questioned the bank about the illegal withdrawal of money, the branch manager had sent him a letter, in which it was mentioned that the bank clarified the matter in a letter on May 18, 2009. However, the complainant claimed that he had not received any such letter. According to the bank, Rs 28,408 was wrongly credited to the complainant’s account as he was not entitled to the same because of the termination order. The complainant had also sent a legal notice to the branch manager, claiming that he was entitled to the subsistence allowance, which was denied on grounds that the employer-employee contract had ended and the bank had debited the amount wrongly credited to his account earlier. While the forum had accepted the bank’s argument, the commission ruled to the contrary. The commission order was passed by its president Sham Sunder and members Jagroop Singh Mahal and Neena Sandhu. The UT Consumer Disputes Redressal Commission has directed realtor Emmar MGF Land Private Limited to allot a plot to two city residents at Mohali Hills in Sector 105, besides paying a compensation of Rs 50,000 for causing them mental harassment and Rs 1.5 lakh for producing false evidence to defeat the claim of the complainant and dodge the commission. The commission has stated that in case the company fails to allot a plot at Sector 105, it will have to refund the entire amount of Rs 27.6 lakh, along with 12 per cent interest per annum and Rs 1.5 lakh as compensation to the complainant for delaying the allotment for three years, besides paying Rs 1 lakh for unfair trade practice by threatening to deduct 20 per cent of the amount deposited by them. The complainants, Gurinder Pal Singh and Paramjit Singh Tuli, had jointly applied for a plot with Emaar MGF at Mohali Hills on first come first served basis in September 2006 and had deposited the initial amount of Rs 13.8 lakh. The company allotted them a plot at Augusta Greens in Sector 109 of Mohali without taking their consent. They immediately contacted company officials and categorically refused to accept it. In its reply, Emmar MGF refuted the allegations. It stated that the complainants had sought change of location of the plot at Sector 109. The commission observed that the company had not produced any record before the commission to show as to how many persons applied prior to the application of the complainants, how many plots were available at Sector 105 and how the allotment was made. This fact not only constituted deficiency in service, but was also an unfair trade practice, observed the commission, comprising president Justice Sham Sunder and members Jagroop Singh Mahal and Neena Sandhu. The commission stated in its order that if the letter of change of plot was received by the complainants, the company would have received an acknowledgement, which had not been produced, which shows that the company had fabricated this letter. Instructions of the Mohali district administration and drainage department to free the seasonal rivulets from encroachments and other obstructions have gone unheeded. Due to increasing land prices, certain well-connected persons are raising structures in the beds of seasonal rivulets (choe) in Patiala Ki Rao choe in Nayagoan and the Nadha area. Claiming ownership over the undulating land that forms part of the course of the choes, the landowners have been dumping malba and loose earth to reclaim possession of the land. Not only in Nayagoan and Kansal, unscrupulous elements are also levelling eco-fragile Shivalik Hills along the choe to reclaim more land. Due to construction of dams upstream, the flow of water downstream has reduced. Several such cases in Tanda, Masol and Karoran villages are in the knowledge of the forest department. Divisional forest officer, Mohali, Vishal Chauhan said complaints in all such cases had been filed in the courts concerned. Recently, Mohali Deputy Commissioner Varun Roozam had issued directions to the Sub Divisional Magistrates to free all seasonal rivulets of encroachments. His predecessors have also been issuing similar instructions, but to no avail. “Such structures not only violate the guidelines of the drainage department, they pose threat during floods. But the condition is that the landowners should not obstruct the water flow,” said an official of the drainage department. In the last few years the ecologically fragile choes, criss-crossing the Shivalik foothills before traversing their way through populated areas, are slowly vanishing. After buying the rights of riverbeds from villagers, the influential persons are illegally occupying the same to build structures or farmhouses. Over the past few years hundreds of acres, which form the riverbed of these numerous choes, are being blatantly turned into private properties. Five outreach centres being set up by the Mohali police in different parts of the town for the convenience of residents are nearing completion. The construction work on these centres was started in December. Wood work is in progress and is likely to be completed soon. These centres are being set up under the community policing scheme at the police stations in Phases I, VIII, XI, Matour and Sohana. 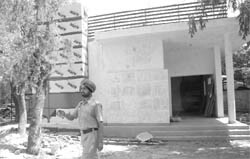 The Punjab Police Housing Corporation is constructing these centres at a cost of Rs 5 lakh each with a covered area of 25 ft by 27 ft. The design of all five outreach centres is the same and each will have an independent entry, a reception, a record room and a waiting area, where chairs will be put up for visitors. These centres will provide instant feedback on various inquiries at a single window. Information in connection with FIRs, various forms of verification and untraced cases will be readily available at one counter and residents will not have to go from place to place to seek the police’s help once these centres become functional. The inauguration of such centres, which were being constructed at the police station levels throughout the state, was likely to be done by Punjab Deputy Chief Minister Sukhbir Singh Badal. Zirakpur to get health centre by April endThe health services in Zirakpur are expected to improve by April end with the commissioning of a 30-bed community health centre at Dhakoli village. The construction of building was to be completed by March 31. Superintendent Engineer, Punjab Health Systems Corporation (PHSC), BS Chopra claimed that the building of the health centre would be handed over to the medical wing in the first week of May. 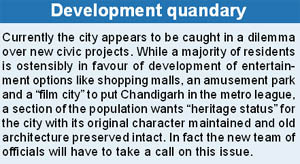 Chopra said the construction work got delayed due to some land issue where some religious structures existed. The issue was taken up with the building department of the Zirakpur Municipal Council and the matter was sought out after two months, he added. According to sources, the two-storied health centre, with an outlay of Rs 2.92 crore, is being set up under the National Rural Health Mission (NRHM). 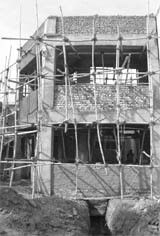 In October 2009, the Punjab Health Minister had inaugurated the construction work of the community health centre. The health centre would have an emergency ward, an OPD, an X-ray machine, one operation theatre and computerised registration. Sources said a team of four specialist doctors, along with three emergency doctors and one SMO, would be deputed for emergency services. An ambulance would also be deployed at the centre. Sources added that the health department sanctioned the team of doctors and staff members for the community health centre. Dr Meena Hardeep Singh, SMO, Dera Bassi, stated that the health centre would be functional once it is handed over to the medical department by the PHSC. Hundreds of residents of Sector 20 and Sector 12-A staged a demonstration on the Zirakpur-Kalka national highway (NH-22) after the national highway workers dumped sand on a road in the vicinity, thus blocking the sector’s road opening on the highway this afternoon. Infuriated over this, the residents gathered on the spot and started raising slogans against the workers. They said the road blockade would compel them to travel more than 2 km to reach the national highway. Following this traffic was disrupted on the highway for nearly an hour. Later, tehsildar Satish Singla reached the spot and got the sand lifted. The Punjab government has failed to complete the work on the Manouli-Derri bridge, causing great inconvenience to residents of the area. Dr Jasdeepak Singh, in charge of the doctor cell of the Punjab Pradesh Congress Committee, said according to information, which he had gathered through the RTI, the work on the bridge should have got completed on May 25 last year. The Punjab PWD Minister had given an assurance in the assembly last year that work on the Manouli-Derri and Dharamgarh-Kambali bridges would get completed in time. But this had not happened and people of the area had now started getting the impression that the government was not bothered about the development of these villages. He said during monsoons people faced problems as they had to cover an additional area to reach Manouli village, which had a senior secondary school, a post office and even a dispensary. Nagma, a 9-year-old girl, was killed after being hit by a speeding truck on the VIP road here this morning. The deceased was playing along the road when the incident occurred. The victim died on the spot. The body was handed over to family. However, no case was registered till the filing of this report. Financial assistance of Rs 45.99 lakh was provided to 288 beneficiaries by the District Welfare Department under the Indira Gandhi Priyadarshini Vivah Shagun Yojna in the last fiscal ending March 31. Stating this, Deputy Commissioner Ashima Brar yesterday said the state government had implemented the yojna for the uplift of Scheduled Caste people living below poverty line (BPL) and the families of Vimukt and Tapriwas Jatis. categories the amount had been increased from Rs 5100 to 11,000. She said to avail of the benefit of the scheme, the girl should be 18 years of age and should be a bonafide resident of Haryana. Besides, the name of the beneficiary should be included in the list of below poverty line. The Deputy Commissioner said under the House Grant Scheme, a sum of Rs 34.6 lakh had been distributed among 158 beneficiaries up to March. Enumerating the details of the scheme, she said the welfare department had provided grant to people belonging to the Scheduled Caste for the renovation and construction of new houses. Under the scheme, Rs 10,000 and Rs 50,000 were given for the renovation and construction of a new house, respectively. She said the beneficiary should be a bonafide resident of Haryana and his name should be included in the list of BPL. Besides, he should also possess a plot. Even as Class XI admission season has set in, over 14,000 students in the city are still confused. The big question of choosing the right stream stalks both parents and students, who are running from pillar to post. While many claim to have found the answer and have even sort admissions a majority may be wrong. With both parents and children relying on the preconceived notions about various streams and peer pressure rather than a student’s aptitude and choice, they may end up making grave mistakes. “As school heads, when we sit and analyse our success rate, we find Class X students, who secured good marks and opted for science subjects, were not eventually able to make it to good engineering colleges. The sole reason behind it is that they had not got the right aptitude or interest in the subject. Many gave in to their parents pressure, while others followed their friends. This year, we wish to make a change and thus will be providing streams to children on the basis of their aptitude analysis rather than their marks,” said Madhu Bahal, master trainer, CBSE, principal, KB DAV-7. “ When it comes to choosing the right stream, the key criteria should be through SWOT (Strength Weakness Opportunity Threat) analysis. Every student should choose what he or she likes. We at our institute not just counsel students, but even their parents so that they do not pressurise their wards,” says Jasmine, counsellor, State Institute of Education. Parents’ consideration of art and commerce streams as soft options also causes problems. “Everybody wants to opt for science stream, as they feel that commerce or art streams are not that respected or limit students’ options. Everybody is not born to be an engineer or a doctor and all streams, including vocational ones, have an immense potential which can be harnessed by students’ interest. Rather than going in for science subjects, students should opt for streams fit for them to avoid academic and professional disasters,” says RJ Khanderao, regional director, CBSE. In order to choose a stream after Class X, it is advisable that students take an aptitude test that will allow them to know their personal strengths, weakness, skills and intelligence in different fields. An aptitude test is a standardised test that is designed to measure the ability of an individual to develop skills and acquire knowledge. Aptitude tests help in determining the probability of a person’s success in some activity in which he/she has not been trained yet. While choosing a stream after Class X, an aptitude test can be quite helpful for students, as it can provide them with options that they had never thought of before. There are several aptitude tests that are widely available for students. Apart from the aptitude tests available for free on the Internet, there are several other organisations like State Institute of Education, Sector 32. Choosing a stream based on an individual’s personal interest is almost as important as based on his or her aptitude. Hence, the second step towards choosing a subject stream after Class X is to match personal interests with potential careers. Based on personal interests, it can be quite difficult to judge which subjects a student must pursue as even though a student may want to be a doctor, it will not matter unless he/she is good at science. This implies that even though a student may dream of pursuing a particular career, he or she may not always have an aptitude for those subjects. What is your aim in life? Every child grows up with a role model in mind. This role model can either be a family member, a person known to them or even a famous personality. More often than not, a student’s aim in life will be to follow his or her role model. Or else, there may be a certain achievement that a student may want. It is important to identify this ambition in life for a student to judge which subject stream will be best suited for him/her. What subject do you like the most? Before choosing a stream in Class XI, students must keep in mind the subjects they have always enjoyed studying and which they are good at. Every student has a favourite subject in which he or she excels. Students should choose a stream for themselves that includes their ‘favourite subject’ as well. For example, a student who enjoys studying history should take up the art/humanities stream. Similarly, a student who is studying science subjects should take up the science stream. Which subject do you feel is the most difficult? No subject is easy or difficult. The subjects that are found easy or difficult by students depend on their individual aptitudes and interests. In order to choose the right stream, students must think about the subject that they do not enjoy studying at all and also do not excel in. For example, a student who does not enjoy studying social sciences must not take the humanities stream. Listing subjects that a student does not like or cannot perform well in helps in narrowing down the stream that will be most suited for the student. If you are in Class X and confused about the right career path, then here are some frequently asked questions to the CBSE counsellors to help you solve some of your queries. l I want to take up commerce stream in Class XI. However, I am not very good at mathematics. Please suggest me the right option. Well, commerce is a very popular stream after Class X. However, if you are not too good at mathematics, you should rethink. Many students do opt for the subject without maths, but it is not of a great help. You can talk to your teachers and some of your seniors to find out how difficult it will be for you. l I am good at studies and hope to score well in Class X. I am quite interested in psychology and would like to pursue my career in this field. However, my parents do not approve of me taking up art and want me to take up science. What shall I do? We understand the kind of pressure you must be feeling. First of all, I must tell you that your parents want the best for you. They may not be aware of the scope of psychology and its importance. You have to be the one to explain the importance and career prospects of psychology to them. Take them to a good career counsellor and things will be sorted out. l I am interested in taking up science without mathematics in Class XI. However, I may not score well in my Class X boards. Does this mean that I should not opt for the science stream? Though marks are important for admission to any stream, it is your interest and aptitude for the subject that should be the main factor for choosing a stream after Class X. If you haven’t scored well in Class X and you are not interested in mathematics either, you should not take up science stream as it may be difficult for you to score. There are still a lot of options for you. l Can I take up some professional course immediately after Class X? There are some careers, which can be chosen immediately after Class X. However, I will suggest you to complete your Class XII and then your graduation through correspondence. l My son is not good in studies. I do not know what stream he should opt for. I would like him to take up commerce stream, but then I fear whether he will be able to do well in it. What do you suggest? Your fear as a parent is just. You should talk to your son to know his likes and dislikes. You can even ask him to take some aptitude tests that are available on the web. l	We are a family of doctors and we had wished that our daughter would take up the same career as well. However, I am afraid that she will not score well enough to take up the science stream in Class XI. Will she be able to cope with science as her stream and make a career in medicine? Just talk to her to find out if she is interested in studying medicine. I can understand that she has been brought up in an environment, where she has seen medicine as the predominant career. But there are many new and emerging careers as well. Being a doctor yourself, you can tell her the pros and cons of the career and the let her make a choice of her own. l My daughter has good creative intelligence. She would like to take up art stream in Class XI, but I fear that choosing this stream would limit her choices for careers after passing Class XII. Please suggest how to guide her. She will not be limiting her choices for careers if she opts for humanities after Class X, in fact a plethora of options will open in front of her. The “costly” application process at Panjab University has once again left thousands of admission seekers baffled. With the cost of prospectus being Rs 1,800 and the average cost of applying to three courses running up to a minimum of Rs 3,000, both applicants and their parents are up in arms against the university’s indifferent attitude towards poor students. “Even private colleges in the city are not charging more than Rs 700. So why should the university be charging such a high price for a prospectus, especially when we have no confirmation of admission. I am an ex-serviceman, who retired as a non-commissioned officer, and am forced to pay around Rs 5,000, as my daughter wants to apply for three courses under CET. Where will poor people like me go? PU is more costly than any other university in Punjab. What about their tall claims of being student friendly,” said Dalbir Singh Sidhu, who had come to the university from Gurdaspur district. Meanwhile, the university students, who are applying for various postgraduation courses, have expressed concerns over the fate of university’s last year’s promise of making the admission process cheaper. “Students form the largest section of the university, but their welfare figures nowhere on the priority list of the authorities. Last year, when we opposed the hike in the price of prospectus, the authorities assured us that they would do something in this academic session, as the university was supposed to become centrally funded, but even this status is beneficial just for teachers and other employees. Their salaries will increase and student will face the brunt,” said Sunny Mehta, vice-president, NSUI, who has threatened to go on an indefinite hunger strike from April 15. Panjab University is not a central or centrally funded university, so it should only be compared to state universities. We have not increased the tuition fee for the past many years, while a majority of our counterparts have been doing it annually. If we don’t take this amount then how are we supposed to generate funds for the facilities that we provide to students? As far as the centrally funded status for the university is concerned, one of the major conditions is to increase our annual income by 10 per cent. How are we supposed to do that? I had proposed last year that we should analyse all state universities and work out an average of their application process, funds, fees and other charges and implement them to bring PU at par with them. Are all rules meant for colleges only? On the one hand, even the essential funds charged by us are dubbed as unnecessary and exorbitant and on the other hand, they are terming it the costliest application process. We being a private college provide more facilities to students and need more funds than the university, but still we are charging only Rs 250 as application fee for all courses. We should then increase our rates to meet the income demands. People in large numbers participated in the Go Green Cycle Rally organised by the State Bank of India here today.The rally aimed at creating awareness about global warming. It was flagged off by managing director of the bank Diwakar Gupta and UT Home Secretary Ram Niwas. Around 200 bicycles were distributed among poor students. SK Sehgal, chief general manager, State Bank of India, stressed on the need to inculcate the habit of using cycles to make environment pollution free. He said the bank had also started a tree plantation programme in southern sectors of the city.